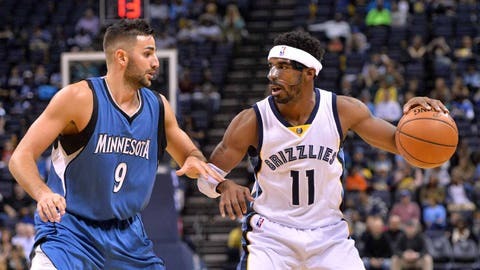 Memphis Grizzlies guard Mike Conley (right) controls the ball against Minnesota Timberwolves guard Ricky Rubio. MEMPHIS, Tenn. — Courtney Lee scored 18 points and the Memphis Grizzlies beat the Minnesota Timberwolves 90-68 on Sunday night to remain unbeaten in the preseason. Tony Allen finished with 13 points, while Marc Gasol and Mike Conley added 12 apiece for Memphis (5-0). Gorgui Dieng led the Wolves with 12 points. TIMBERWOLVES: Kevin Garnett hit all four shots from the field in the first half, finishing with eight points. . . . Nikola Pekovic did not play, continuing to recover from right Achilles surgery. GRIZZLIES: Lee was 3 of 4 from 3-point range. . . . Zach Randolph was the only Memphis starter who didn’t reach double figures, recording four points. RUBIO RETURN: Minnesota point guard Ricky Rubio saw his first preseason action after missing the first four games recovering from a strained right quadriceps. Rubio played 23 minutes, but did not score. SEVEN SIT: The Grizzlies sat seven players: Jeff Green, Matt Barnes, Brandan Wright, Beno Udrih and Vince Carter, plus Jarell Martin and Jordan Adams, who are recovering from injuries. UP NEXT: Minnesota faces the Bucks on Tuesday in Madison, Wisconsin. Memphis travels to Atlanta on Wednesday.